James Antinori, MD, emergency room physician at Mountain West Medical Center, speaks during a press conference Tuesday about the opioid abuse problem in Tooele County and what needs to be done to reverse growing addiction. Tooele City Police Cpl. Shawn Sagers speaks about the community effort to confront opioid abuse. Tooele County Health Department Educator Hillary Bryan talks about the need to dispose of unused medications. Mountain West Medical Center admitting clerk Catherine Tate works behind a desk now covered with messages geared toward educating patrons on the use and misuse of prescription pain medications. Registered Nurse Joleen Perez reads messages about the use and misuse of opioids on the door of Mountain West Medical Center’s Rehab Services. 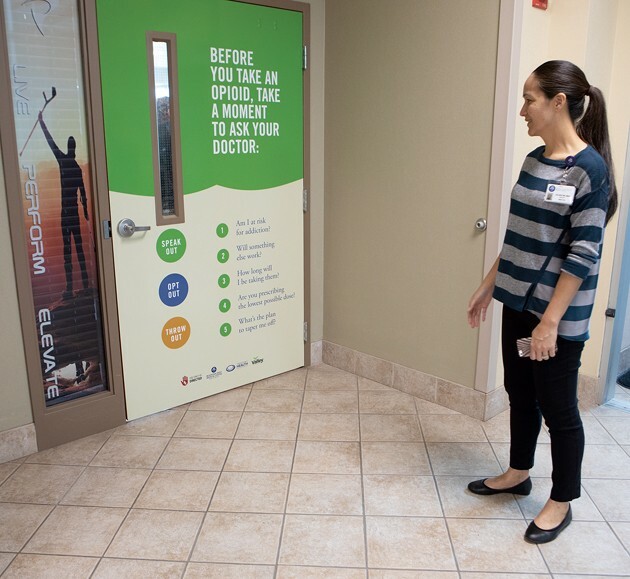 The large-scale messaging on the door is part of a education campaign throughout the center as part of a statewide effort to combat the opioid crisis. Large-scale messaging is now located throughout the center to educate the public. 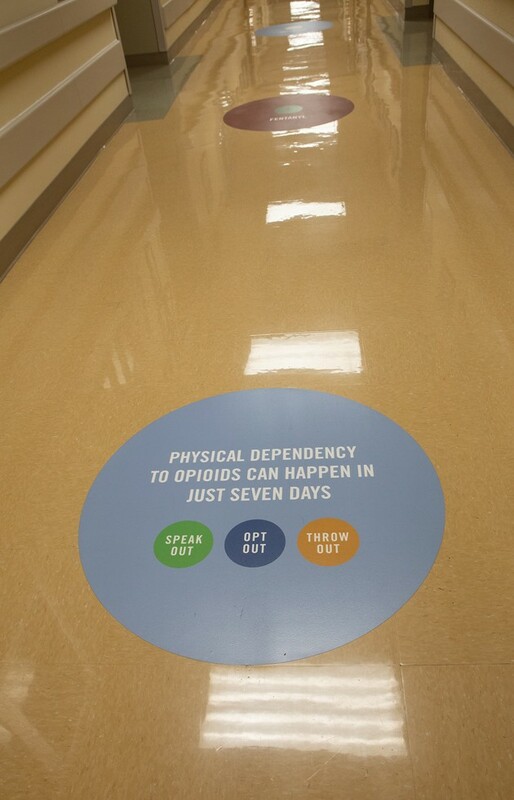 This message is in a main hallway and reminds patrons physical dependency to opioids can happen in just seven days. Local government leaders are striving to educate people in Tooele County about the dangers of opioid abuse with a new public awareness campaign to Speak Out, Opt Out and Throw Out opioids. 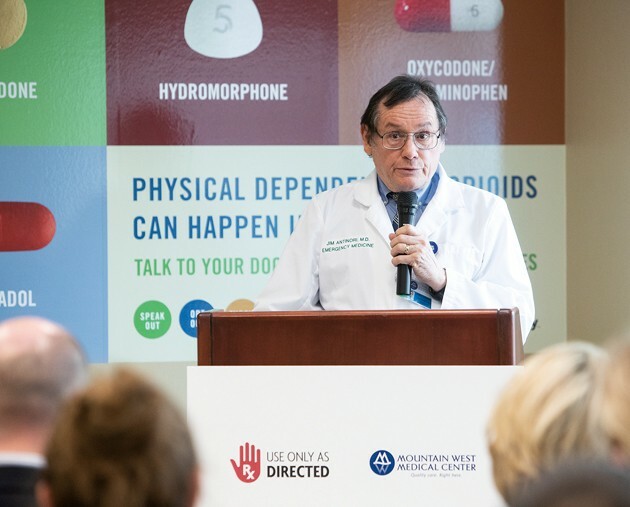 “Opioid medications can be used safely, but they must be used carefully and exactly to what they are prescribed for,” said Dr. James Antinori at Mountain West Medical Center during a press conference Tuesday. “People need to speak to their doctors about it. There are non-opioid medications that can be used. 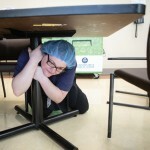 “In the emergency department, we do want to treat a patient’s pain, but we want to do it carefully so as not to create a problem that is bigger than the one we are trying to treat,” Antinori said. 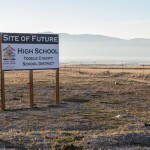 Tooele County ranks sixth in the state for opioid and heroin overdose deaths during 2014-16, according to a news release from the Tooele County Health Department. For many, addiction began with a legal prescription. The news conference was organized by the health department and included comments from Tooele City Mayor Debbie Winn; Antinori; Dr. Greg Gardner; Corporal Shawn Sagers of the Tooele City Police Department; and Hillary Bryan, health educator and public information officer with the health department. “We are serious about working together to address this issue, so we can save lives,” Antinori said. The Tooele County Opioid Awareness campaign is part of a statewide effort to combat the opioid crisis. Several government leaders also attended the press conference, including Grantsville Mayor Brent Marshall, Stockton Mayor Thomas Karjola, Grantsville City Police Chief Jacob Enslen, and Sen. Daniel Thatcher. Valley Behavioral Health and Use Only As Directed are partners in prevention and the initiative as well, according to the news release. Gardner said opioids are useful in an acute setting, but not as useful in a chronic setting and may cause harm. He said community initiatives have been effective in spreading the word about opioids. Antinori said MWMC uses a Naloxone prescription program to reverse the effects of an opioid overdose. 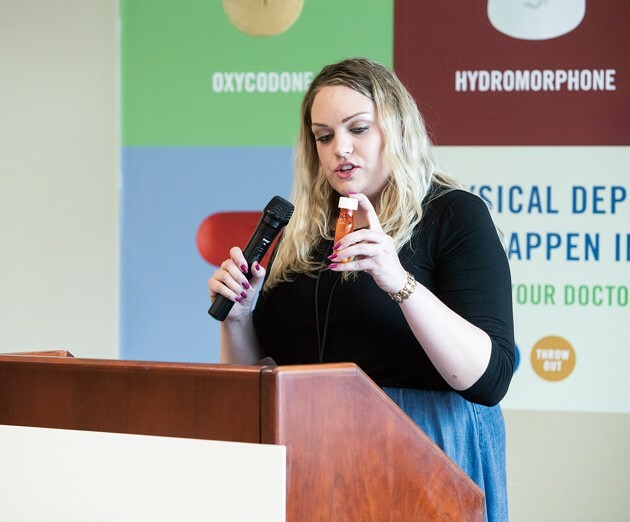 “We’re not here to judge or criticize, we just want to be able to provide this medication to anyone who feels they are at risk of overdose,” Antinori said. Sagers said Naloxone is carried by and used by police officers. 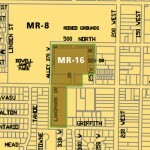 “It is exciting that our community is working on this problem daily. It excites me to be a part of this work,” Sagers said. 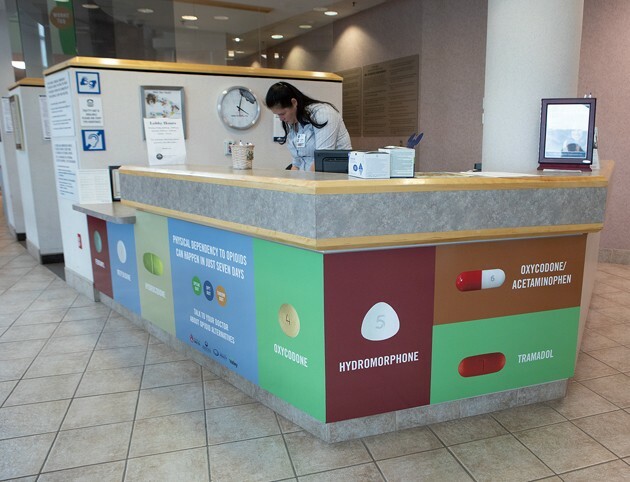 Large-scale messaging throughout the hospital will educate patrons to the fact that 7,000 opioid prescriptions are issued each day in Utah, increasing the chance for misuse or abuse, according to the news release. Some of the messaging is permanent and some of it will be removed in a few months, Bryan said. 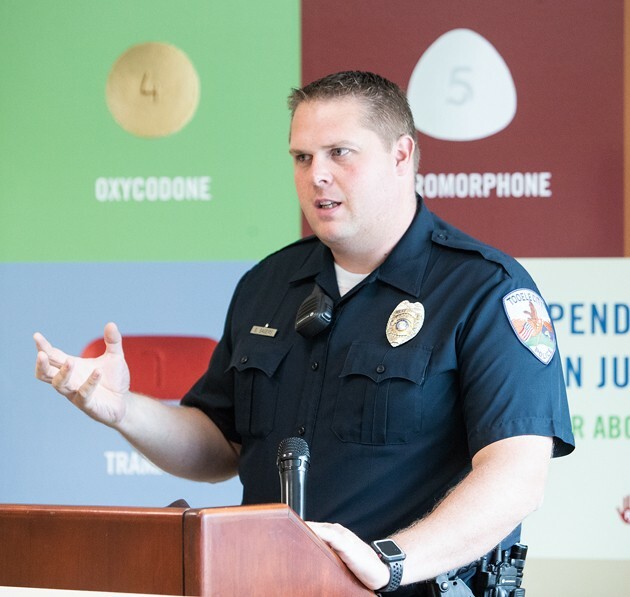 “We are working on a few projects throughout the community that coincide directly with this opioid campaign,” Bryan said. Never share prescriptions, dispose of unused medications properly and in a timely manner, and talk to your doctor about possible opioid alternatives,” according to the news release. Naloxone is available at the county health department to those at risk or those caring for someone at risk of overdose. To learn more about available treatment resources, please visit: findtreatment.samhsa.gov/locator/home.